Early this morning on the OTR trip with my husband in his big rig I had a “That’s it!” moment. You could interpret this in more than one way, but for me it meant I was excited because it had to do with food. The first time I took a trucking road trip with my hubby, Mr. Fun, he stopped at a particular truck stop gift shop that is the coolest little place. I bought a jar of peach habanero jelly that the shop employee recommended. The stuff was H-O-T but awesomely yummers! We finished off the spicy jelly and since then, I’ve looked for that place every time I ride with Mr. Fun on a OTR trip. I looked for it, tried to describe the gift shop to him, and racked my brain trying to remember where in the sunflower state of Kansas that little shop could be. This morning I found it. We prepare the simplest meals possible that are nutritious for the truck kitchen. A small fridge is on the agenda for near-future kitchen additions, but currently, we keep perishables in a cooler with ice. We’ve also been window shopping for the perfect appliance to cook in. At this time, we get by just fine with our carefully chosen food selection. However, today I was hungry for eggs. The truck stop store didn’t have boiled eggs. I asked a lady at the counter, and she said all they had was pickled eggs. I didn’t think that sounded great for breakfast, so my husband suggested we go to McDonald’s which was next to the truck stop. The thing I like about McDonald’s is the breakfast menu. Therefore, I was a happy camper when they decided to expand breakfast items all day. I especially like egg and sausage McMuffins and McGriddles. I fact, I like egg/sausage so much that oftentimes, I make my own versions at home. Sometimes, I cook egg and sausage and other times, hamburger and egg. Today I meant to order a McGriddle breakfast sandwich but instead, I asked for an egg and sausage McMuffin. It was the wisest choice because it’s 100 calories less than the McGriddle. Immediately as we walked into the McDonald’s plaza, my interest was piqued. To the left was a nice little welcome center with Kansas brochures, and then we turned to the right. “That’s it!” I said in amazement to Mr. Fun. “That’s the gift shop I’ve been looking for.” Now we both know where to find my favorite little shop at the travel plaza in Kansas. 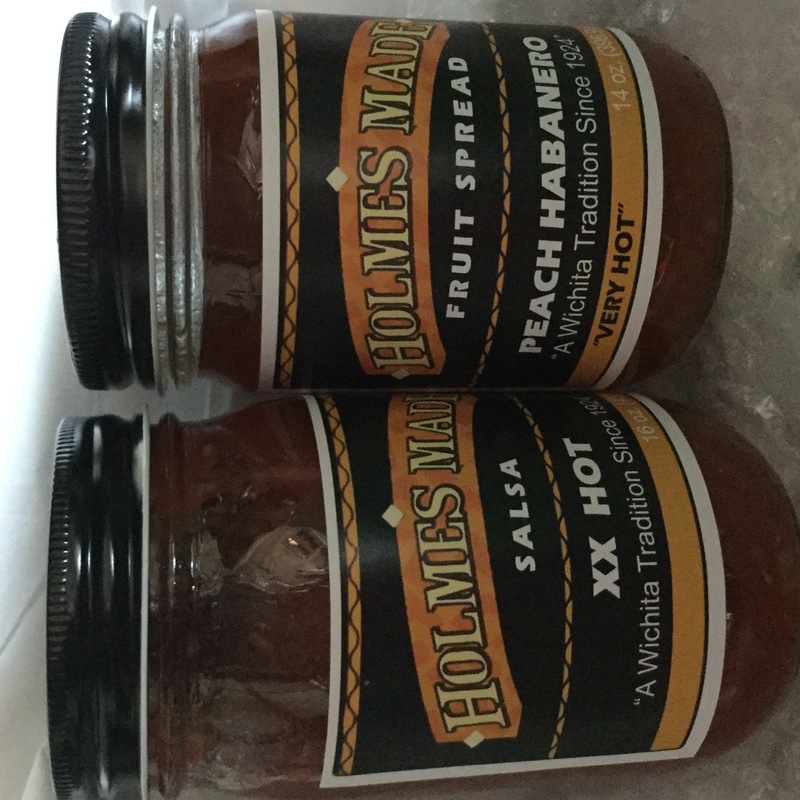 I’ve blogged before about this special hot jelly that the Holmes company makes. I figured since the jelly is truly hot, the salsa must be also and I purchased both today. The spicy peach jelly is so good that I’ve started putting it in some recipes like my salsa and dip. Eggs, jelly, and salsa are all good for truck as well as home meals. Sausage is good, too, but it helps to have an appliance in the truck for cooking the sausage or keeping it warm. Therefore, I’m hoping to get the 12-volt lunchbox-style cooking apparatus soon. I’ll keep you posted on my finds. Your truck road trips sound like fun! I’m so glad you found some of the peach jelly. It sounds fabulous! They are fun! I was really excited to find the peach jelly. Can’t wait to make more recipes with it. I agree with you. 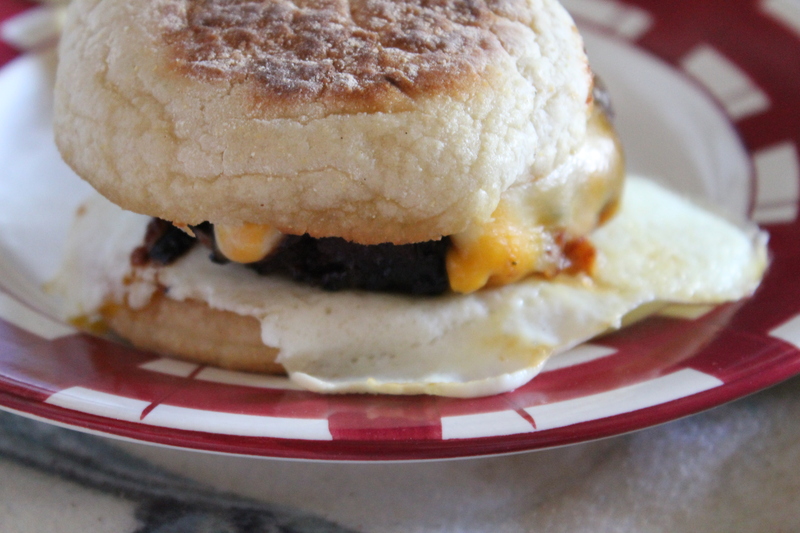 I love McDonald’s breakfast, but my favorite is the egg McMuffin.